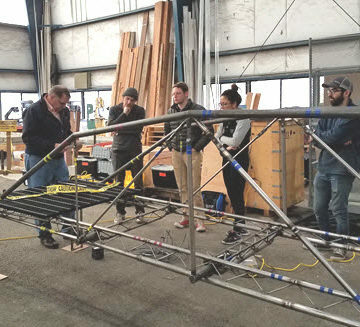 It’s Student Conference season for ASCE Student Chapter members on steel-bridge and concrete canoe teams, the chance to turn a school year of hard work into a coveted spot in the upcoming 2017 national competitions. Hectic, exciting, and maybe a little stressful. At Oregon State University this spring, it’s all of those things and then some. OSU’s School of Civil and Construction Engineering and the OSU ASCE Student Chapter host the 2017 National Student Steel Bridge Competition, May 26-27. 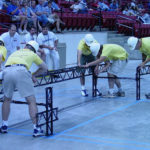 ASCE and the American Institute of Steel Construction co-sponsor the national competition, which began in 1992 at Michigan Tech University. 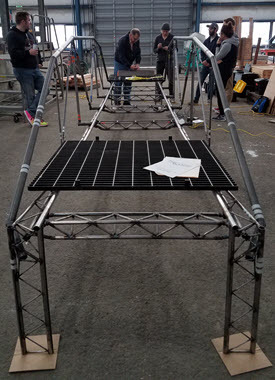 Student teams erect and test bridges they have designed and fabricated to meet client specifications. They compete in six categories – aesthetics, lightness, stiffness, construction speed, construction economy, and structural efficiency. Faculty and students at Oregon State have been planning the 2017 national event for more than a year. 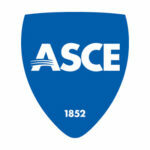 Senior Chelsea Farnsworth, S.M.ASCE, and junior Oscar Gayet, S.M.ASCE, share student director duties. During their student tenure, Oregon State has built a tradition of steel bridge success, qualifying for nationals the last three years. “I think having that experience already has made them even more effective at planning this year’s nationals,” Liu said. These are the kinds of lessons students have been learning through steel bridge for nearly 30 years. The competition might be a controlled environment, but the civil engineering challenges are real. The bridges the students build must support 2,500 pounds, often while only weighing about 100 pounds themselves. Parucki recalled past bridges being repurposed for the real world as spans for golf carts. “I feel like it’s a very good opportunity for students to get field experience in a college setting,” Farnsworth said. “Being involved in a club that makes you do the whole process – design, fabrication, construction – and then actually seeing the product unfold before you, it’s really awesome. And it gives students a really good opportunity to connect with other students and professionals from all over the world.